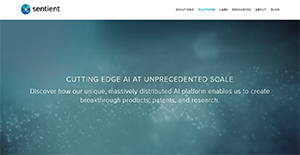 Sentient is a massively-scaled AI technology platform that empowers users to make better-informed decisions. It analyzes data, assesses patterns, and makes connections to provide implementable solutions. It evolves through continuous use and solves more challenging issues as it gets smarter with intelligent answers. With Sentient, decision-makers can make sounder choices to advance their organizations and provide unparalleled services to their customers that transform their industries. These changes are driven by multiple AI technologies that enable the platform to offer autonomous solutions. Further, Sentient can understand what a users’ intentions are through visual and non-verbal engagements that allow it to generate relevant content at a rapid pace. Sentient’s AI technology is designed to mimic biological evolution. This enables the platform to swiftly learn new things, adapt to changes, and react to challenges. This further lets it use specific data to solve issues. Additionally, the platform can work on a semi-autopilot mode on CPUs or GPUs. This lets I.T. people reserve more of their attention to other complex AI challenges rather than manning the platform full time. With Sentient, no matter what problem or issue an organization is facing, they can rest assured that they can find a solution. That is because the platform rests on a scalable evolutionary computation that runs through numerous units to create a system that can arrive at a resolution. Sentient does not simply process the data input into its system—it also processes the user’s intent to provide information that is tailored exactly to their needs and preferences. This allows the platform to assist organizations in changing the way they offer great experiences to their customers across various industries. Sentient is armed with technologies that enable it to deploy visual perception tools that let it perform multifarious tasks. One example is the processing of any number of images and integration with organizations’ existing workflows. The feature is continuously enhanced, and its additions will allow it to understand assorted types of content. If you are interested in Sentient it could also be sensible to check out other subcategories of Best Artificial Intelligence Software gathered in our database of SaaS software reviews. It's essential to realize that almost no software in the Artificial Intelligence Software category is a perfect solution that can match all the goals of various business types, sizes and industries. It may be a good idea to read a few Sentient reviews first as some solutions might excel just in a really small set of applications or be designed with a very specific industry in mind. Others might operate with an intention of being simple and intuitive and as a result lack advanced elements welcomed by more experienced users. There are also apps that support a wide group of users and provide a powerful feature set, but that frequently comes at a more significant price of such a solution. Make sure you're aware of your requirements so that you purchase a solution that provides specifically the functionalities you look for. How Much Does Sentient Cost? Sentient offers multiple products for different industries. Companies interested in the cloud-based solutions can request for their enterprise pricing and schedule a demo via phone, email, or web form. We realize that when you make a decision to buy Artificial Intelligence Software it’s important not only to see how experts evaluate it in their reviews, but also to find out if the real people and companies that buy it are actually satisfied with the product. That’s why we’ve created our behavior-based Customer Satisfaction Algorithm™ that gathers customer reviews, comments and Sentient reviews across a wide range of social media sites. The data is then presented in an easy to digest form showing how many people had positive and negative experience with Sentient. With that information at hand you should be equipped to make an informed buying decision that you won’t regret. What are Sentient pricing details? What integrations are available for Sentient? If you need more information about Sentient or you simply have a question let us know what you need and we’ll forward your request directly to the vendor.